I have no idea what the difference is between Mandelbrodt (also know as Mandel Bread) and Biscotti. I’ve looked. The only thing that I’ve found that keeps them apart are their locations. 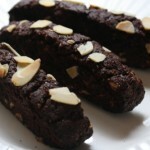 Mandlebrodt is a Jewish Eastern European and Biscotti is Italian. That’s it. Otherwise they are the same. I love the smell of almonds cooking. I also love the smell of almond extract. I just open the bottle and it brings back memories of my Ashkenazi grandmother (not to be confused with my Iraqi grandmother who inspired my kubbeh soup.) She was an amazing baker. She made all sorts of cookies. 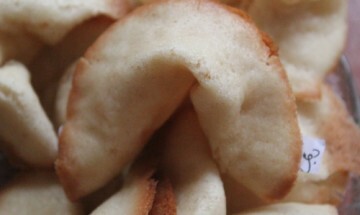 Pinwheel cookies were her specialty and only came out on special occasions, but mandelbrodt was a staple in her house. Isn’t it amazing how something as simple as a smell can trigger such strong memories? Softa (hebrew for grandmother) made her mandelbrodt vanilla, but as you know, I’m a chocolate girl, so I decided to shake things up and make them chocolate. 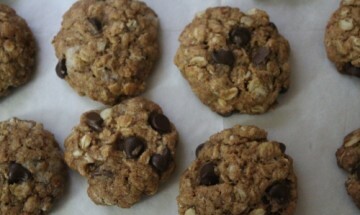 If you want vanilla ones, just use 3 cups of white flour instead of the whole wheat and cocoa. Besides that, the recipes are the same. Between the two of us, I have to say that I like my mandelbrodt better than my grandmothers. Don't tell anybody. Form into loaf of 1 inch high and 4 inches across and place on a greased cookie sheet. Cool loaf on a rack. 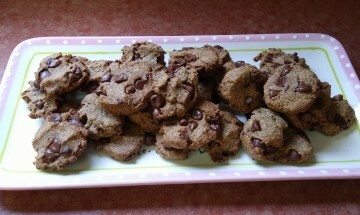 Place on cookies sheet and bake another 5 minutes or until dried out. To toast the almonds, just chop them up and put them in a frying pan on medium heat, stirring continuously until they start to brown. Don’t put anything else in the pan. This takes a bit of patience, but it makes a big difference in the taste. My Softa always made thick cookies. If your grandma made them thinner, just adjust the time that you take to bake them a second time. This is not supposed to be a moist cookie. I like to think of these babies as tough cookies, just like my Softa was. According to Gil Marks’ fascinating new book The Encyclopedia of Jewish food, the word biscotti means “twice cooked”, and mandelbrodt means “almond bread”. 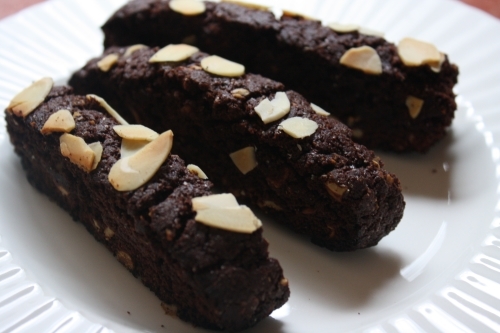 Biscotti (sometimes flavored with almonds, but also with anise or hazelnut) came first in the early Middle Ages in Italy, and later to central Europe where they took the name mandelbrodt. The difference between them, according to Marks, is that biscotti contained no fat, whereas mandelbrodt did have oil or shortening (but never butter). However, in the 1980s, many brands of biscotti added fat, making them in essence mandelbrodt, but still calling themselves biscotti. Dave, I knew that I could count on you! I was careful when I chose the title of the post – I left out the word almond on the mandelbrodt side. What did Italians use instead of fat for their biscotti? When making up this recipe, all the recipes that I referenced for both of them were basically the same. I guess that all the recipes that I saw were from after the 1980s.